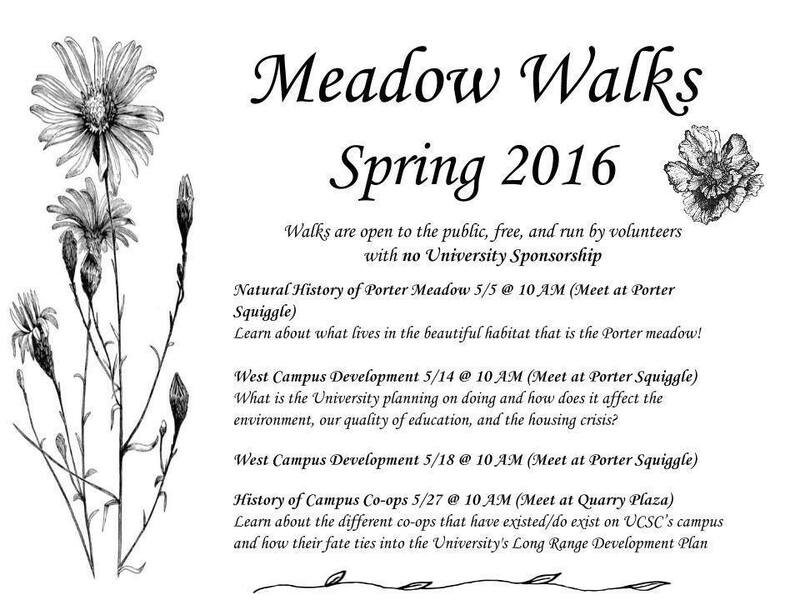 The Spring Forest Walks schedule is now available! It features 16 free walks/classes in Upper Campus. The northern portion of the UC Santa Cruz campus is a place of towering redwood and mixed evergreen forest, colorful and fragrant chaparral, peaceful meadows, and fern-filled gullies. It's a landscape rich with history and stories, treasured by the many people of Santa Cruz and UCSC who traverse its trails and encounter its beauty. Unfortunately, this forest is gravely threatened by UCSC’s Long Range Development Plan. 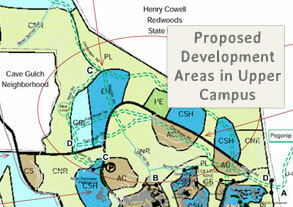 Despite overwhelming campus and community opposition, UCSC administrators have pressed forward with efforts to construct new buildings, roads, and parking lots on 240 acres of Upper Campus forest and chaparral, imperiling dozens of threatened and endangered species. 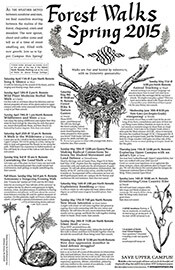 UCSC's proposed expansion would not only destroy irreplaceable native habitats and eliminate a keystone piece of Santa Cruz's greenbelt, it would also unfairly burden local residents by increasing UCSC enrollment by 3,500 undergraduates (plus faculty, graduate students, & staff) and drawing up to an additional 152 million gallons of water per year from Santa Cruz's already overextended water supply. 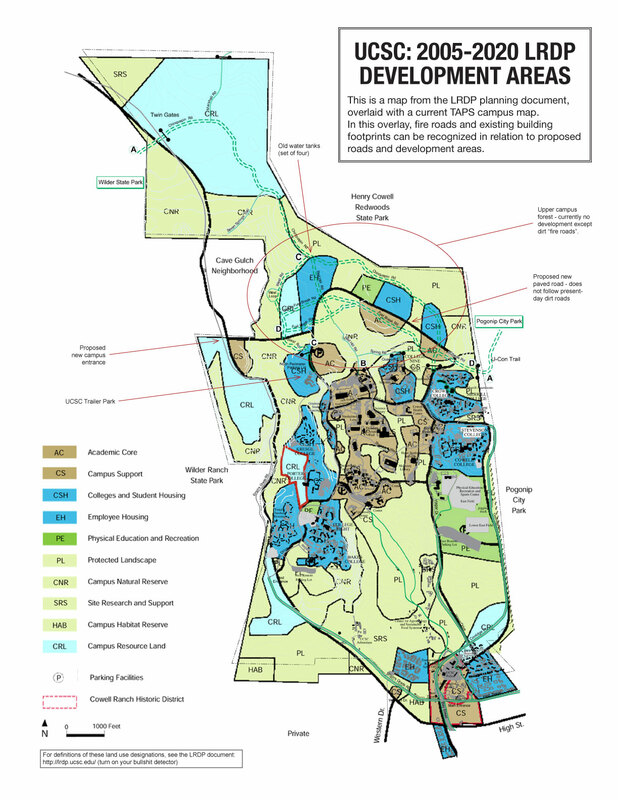 In November 2006, 80% of Santa Cruz voters adopted a measure requiring a vote of the people before water services could be extended for UCSC expansion. University lawyers sued and got the measure thrown out on a procedural technicality, and it was never reintroduced to the ballot. Recently, city officials have attempted to facilitate the extension of water services without voter approval. This process was recently stalled by a successful lawsuit filed by a citizens group named Habitat and Watershed Caretakers, and no one is sure what will happen next. As the drought deepens and issues of water supply and local sustainability are on most everyone's minds, we believe it is time to come together as a broad and diverse community to finally turn the tide on irresponsible and destructive UCSC growth. A coalition to Save Upper Campus is being built, and we invite your participation! The position of the Save Upper Campus coalition is that the Upper Campus forest is not an acceptable location for any development project. We are calling for the permanent protection of Upper Campus as an ecological reserve.